As I said yesterday, the Tuesday Trigger this time has my creativity simmering! 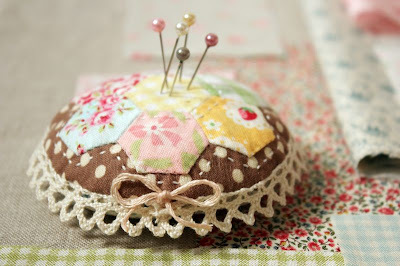 Tuesday Trigger - SEW cute! When Cath put this Tuesday Trigger up, I practically fell over myself gathering some papers to play along. This one hits all my buttons, and then some! This one features the Designer Woodgrain background, the Floral Blossoms cling set as the main image, and a clear set called Find Joy for the sentiment. I used 3 distress markers to color the roses: Mustard Seed, Worn Lipstick, and Peeled Paint. After coloring them directly onto the rubber of the stamp, I spritzed with water, and stamped onto ordinary cardstock. Then I cut out my panel using Spellbinder's Nestabilites Labels Eighteen, and framed it in gold hand-cut label. My next card uses the same principles. 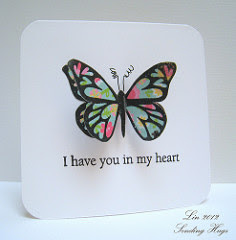 My Hero Arts Stamp here is called Garden Bouquet and the sentiment is from the clear set called Just Find Me. This time I used Wild Honey and Peeled Paint distress markers, and a Tombo periwinkle marker. I just sponged on some Shaded Lilac distress ink while the panel was still in the Scalloped Rectangle die. 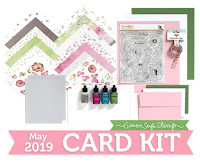 Please head on over to our blog and see what gorgeous things Guest Designer Piali and my teamies did with Hero Arts stamps! 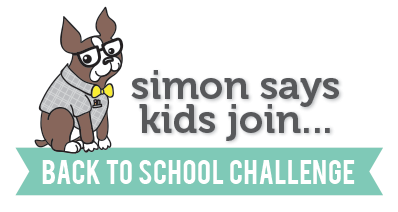 As always, Heidi has provided another $50.00 gift voucher at the Simon Says Stamp store for the random winner of this challenge - it could be you! You don't have to use Hero Arts stamps, but we'd sure like to see them if you have some! .......and it came true! Got some happy mail yesterday which I can't share just yet, but I wanted to encourage you all to have a dream and go for it! I'm entering this into MFW's Focal Point contest. I really tried to use 2 background prints ala Wanda, but could find nothing in my stash that worked, until I came upon this digital aqua gingham, and you know me and gingham - it won! Thank you, Wanda, for your inspiration! 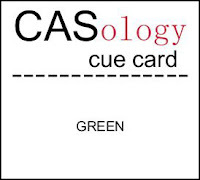 The word this week at CASology is green! I thought about this for awhile, and kept coming back to how beautiful shade gardens can be......they are usually made up of various sizes and textures of interesting leafy plants, sometimes flowers, but mostly just 1000 shades and shapes of green. So then I went and pulled out all my leafy stamps, and finally decided on this big fern. If I'm understanding this design concept correctly, your eye should go to the popped roses cluster first, then the repeated subtle stamped roses in the background, then to the sentiment, and finally to the delicate frame that encloses all of them, which brings you back again to the main roses. Hmmmmm......I think I need this issue! Hi! 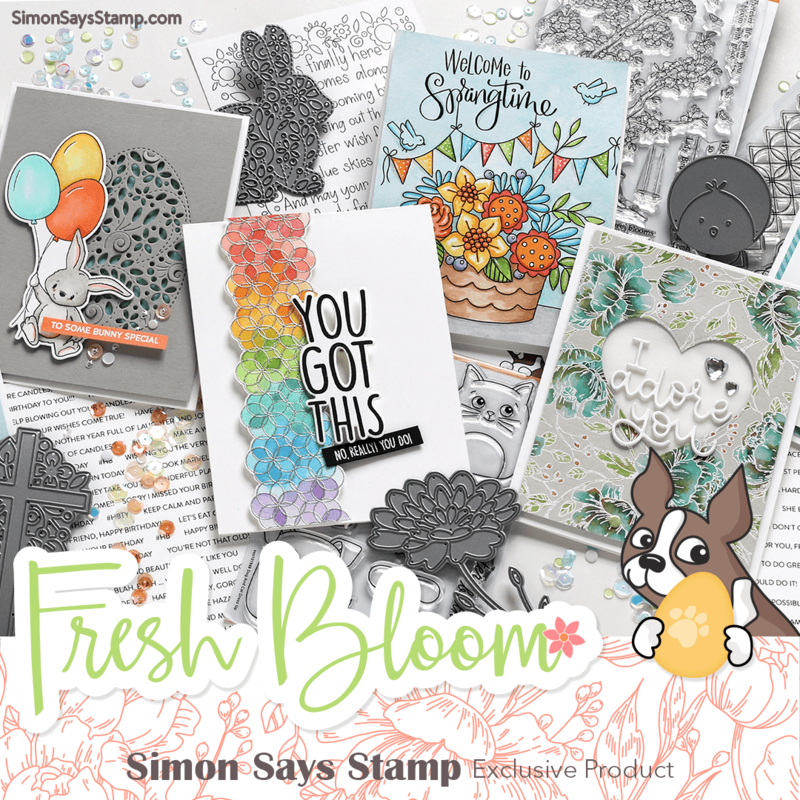 It's time for another Simon Says Stamp challenge! I stamped, colored, and cut out this adorable Popcorn the Bear from the School Days set, and set him against a blackboard made of a paint chip framed in a woodgrain paper from My Mind's Eye Howdy Doody. paper pad. I used my favorite white pen, the Signo uni-ball white gel pen to write on it. Then I embossed some red cardstock with the Sizzix Dots embossing folder as my card base, and put everything together. What will you make this week using our theme? 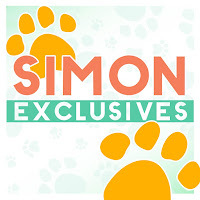 As always, Heidi has provided a $50.00 gift voucher to the Simon Says Stamp store for our random winner! Need some ideas? Come on over to our blog to see what the our Guest Designer Piali and the rest of the Design Team did! 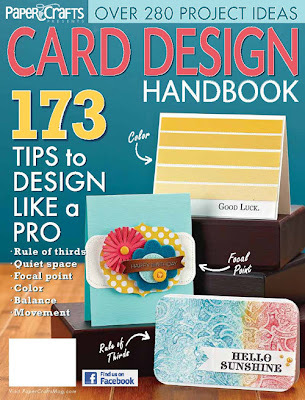 And my card fits for the Card Design Handbook Week: Focal Point Challenge at Moxie Fab World, too. Thanks for your visit and your kind comments! I made it my own by adding the music to the background and choosing the lovely peachy-pink color for my flowers and buttons. Thank you, Clare, this was a fun exercise! Last Friday, Cindy hosted our 46th 90-minute scramble at the Hero Arts flickr group, and one of her sample cards was this gorgeous one. I fell in love with it immediately and could not wait to CASE it. I used what I had on hand: CG405 Leaf & Floral Background, AC005 Untitled Word Shadow, Cup 'o' Joe mid-tone ink, Grass and Splash chalk inks, Layering Papers from the Earth, Foliage and Pool sets, Art Flowers, and Mixed Buttons from several sets, all Hero Arts products, plus Colorbox Frost White ink. I plan to add some other colors and then I'll have a nice gift set for someone special. 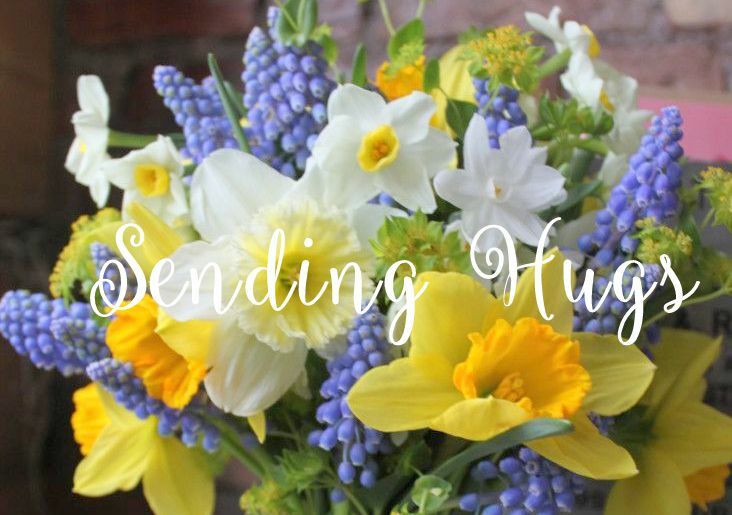 Thank you, Cindy, for your wonderful design! Here's another entry for A Blog Named Hero's challenge. I love kraft and had forgotten that it is really lovely when stamped and colored with colored pencils. I used 2 "shades" of kraft and these Hero Arts stamps: CG127 Flower Box, and a woodblock from 2002 that I found in a local stamp swap this spring - was thrilled to find it, as I don't think I've ever seen it, and the set appeared to be brand new! The set is LL747 Friendship Messages; the one I chose for this card is E2289 Thank You Message. 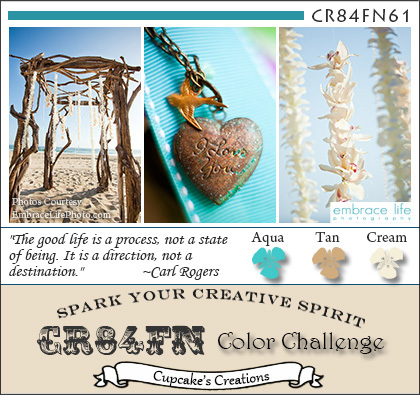 The challenge for this week's CAS-ual Fridays is to be inspired by the ocean. I knew exactly what I wanted to do, after reading Maile Belles' article this morning about watercoloring. I stamped the grasses and clear embossed them on watercolor paper, then just put some distress inks on an acrylic block, spritzed them with lots of water and painted on my background color with a big soft brush. Again, I used my favorite current Hero Arts sketch to put this card together. 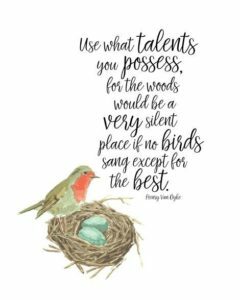 This may be one of the most CAS cards I've ever done, and I like the sentiment with it - this will be a perfect card for my chemo patients or for anyone needing a little encouragement. 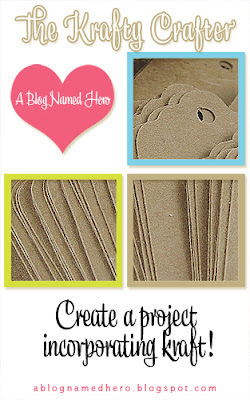 Our challenge over at A Blog Named Hero is to use kraft paper in our creations. In going to get my kraft cardstock, I found in my stash a couple pieces of Core'dinations/Tim Holtz kraft core and chose this dusty pink color to use for this challenge. I hadn't tried dry-embossing it and wanted to see the effect. I like it - will be stocking up on more colors, now! I had trouble stamping on the kraft core, however - the inks I tried faded, even when embossed, so I had to use a scrap of another paper close in color for my flowers. Has anyone else had this problem with the kraft core? And since this layout is loosely based on one of the sketches this month for our Hero Arts contest, I'll enter this card there also. Wallpaper Flowers.....is the name of the stamp I used for the strip on this card, made for the Hero Arts August contest, using one of the 3 sketches they've provided. The stamp is from 2009, and I paired it with a new birthday sentiment stamp from this summer. and I can't wait to see what fills up our gallery!! I LOVE the Simon Says Stamp Store! If you haven't already, take some time and go see all the brands that they offer! There are things there that I never knew existed, among them this adorable Teddy named Popcorn from Crafter's Companion in the UK, and you can get him doing all kinds of fun things. Back in the dark ages, I collected Teddy Bears and still have them all over my house. When I saw the Football Crazy set, I screeched to a halt and put him in my shopping cart! What will you make for this week? 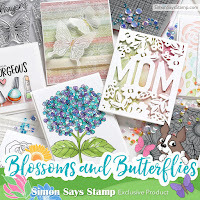 Please visit the Simon Says Stamp Challenge blog and see the other fun creations from the design team and our Guest Designer Piali, and then link up yours - you might be the random winner of the $50.00 gift voucher from the Simon Says Stamp store!! I made this card for The Shabby Tea Room's challenge this week: using pink, aqua, cream and text. I recently got these 3-step roses from PTI - here I only used 2 of the steps, leaving the base cream to tie it in with the rest of the card. I just received some new (to me) stamps from Hero Arts, and had a little play, using one of the sketches they've posted for our monthly challenge. This black and white color scheme is so not my style, but once I'd stamped the friends definition, it just seemed to follow to keep almost everything else in the same colors, except for those tiny splashes of pink in the centers of the flowers. And because this lack of color is very outside the box for me, I'll also enter this into CASE Study's "Think Out of the Box" challenge again. Here is my card for this week's CAS-ual Fridays challenge, to make a square card. 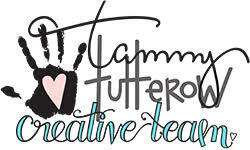 I remember doing a similar design back in 2010, after a tutorial by Hero Arts artist Nancy Taylor. Simply, I stamped this old favorite Heart Winged butterfly on printed paper 3 times, heat embossed it, then cut it out, and glued all 3 together, trimming as needed. I cut off the original antennae and used some black wire instead. I love this sentiment with this image! We have not one but 2 very special prizes for this event !! 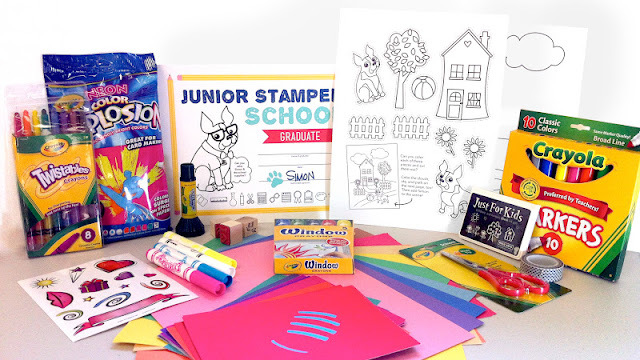 In celebration of crafting with our kids, we have developed this "Junior Stamper" kit targeted for ages 4 through 14. 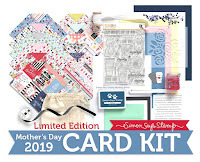 The kit includes whole assortment of products from stamps, ink, neon papers, coloring pages, twistable crayons, markers, window markers, to stickers, construction paper, glue stick, washi tape, and scissors (safe for 4+). 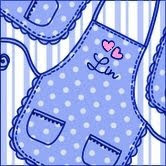 There is a huge list of supplies and many of them reusable for a long time to come. It's important to celebrate our children and so the kit is complete with a "Junior Stamper" Certificate of achievement. 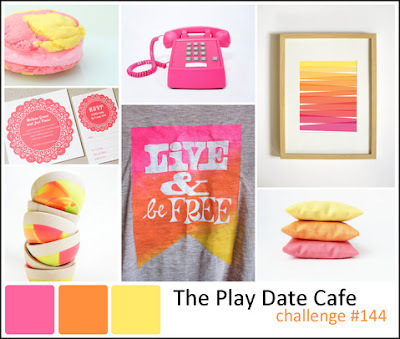 Couldn't resist playing with the colors at the Play Date Cafe challenge this week; summer to the max! I'm also entering this into A Blog Named Hero's Freestyle challenge. 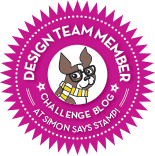 Another Wednesday, and time for a new challenge at the Simon Says Stamp Challenge blog! 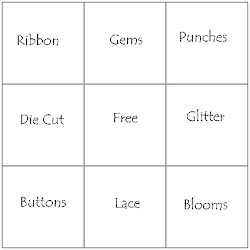 This week we have a fun Bingo board: just choose a column, row, or diagonal for your elements. I used these Memory Box products: Pixie paper in the background, the Index Card stamp, and the Meadow Leaf die. I used the first column on the left: ribbon, die cut, and buttons. The stamped sentiment is from this Hero Arts cling set. What will you make for us this week? 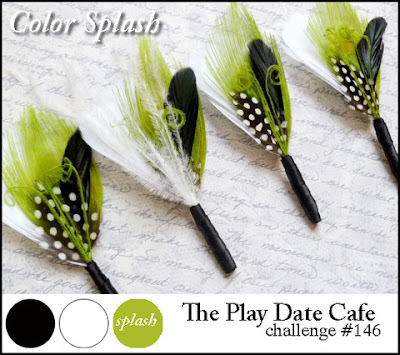 Please visit the Simon Says Stamp Challenge blog and get some ideas from our Guest Designer Piali and the rest of my teamies. 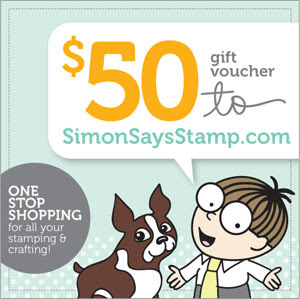 Heidi has provided another $50.00 voucher for the random winner to shop at the Simon Says Stamp Superstore! I was in the mood for something very softly colored. It's still hot here, and these colors just feel cooler to me! I first stamped the label and sentiment, then masked it, masked off the edges of the card, and clear stamped and white embossed the lattice. Leaving on all the masks, I then sponged on spun sugar distress ink. Of course I chose a flower to embellish this simple card, and added a button to it's center, some leaves, and a few pearls. Because I was kind of following the outlines of my previous card, I chose the herringbone embossing folder for this card. And I like that I used an older (scallop border) and a newer (roses and sentiment panel) stamp to make it. These roses remind me of a red rose bush that came with our house when we bought it. You all know that red is not a favorite color of mine, I even prefer pastels in my flowers, so this plant has been moved many times. It must be on its own stock, because it is still going strong! 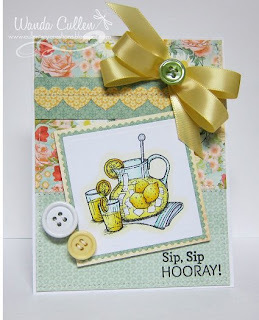 There's an interesting challenge at CASE Study this week (and a wonderful 2nd Anniversary blog hop I encourage you to visit for amazing inspiration). The challenge is to make a card showing off your signature style. I like to dabble in lots of styles, but using these elements makes me happy: mixing patterned papers, the use of gingham and hearts, text, lace, buttons, pastels, and flowers. I just got this new Carta Bella "Beautiful Moments" paper pad, and decided to start with it, and then try to bring in those elements. This is a layout I often use. I chose the center panel because of the word "Joy" in it, which is my life's word (and there are some little birds there, too), and also because I like the way adding text breaks things up and gives a little more interest. Then I chose 3 patterns for my flower, and constructed it with foam squares in between each layer so that the layers showed up better. The small gingham is the only pattern not in the paper pad. The other papers were chosen to help bring in most of the colors in the central panel. Using a stripe is another thing that I do often - it seems to look good with most any other pattern. So, what is my style? I liked the way Nina Brackett described her style: Simple Shabby. I think I'll go with that, at least for today! I am also entering this into A Blog Named Hero's challenge: Freestyle this week.